Westend - Seafield/ Kleinemonde Accommodation. 8/27 - The West Kleinemonde River floods this plain when it is full. 13/27 - The outdoor dining table at the braai extends to seat 8 people. A bench accommodates 2 more. 20/27 - The Top Level bedroom is an en-suite with freestanding bath and toilet. 22/27 - The Lower level Lounge has a TV with own Premium DSTV channel and DVD player. 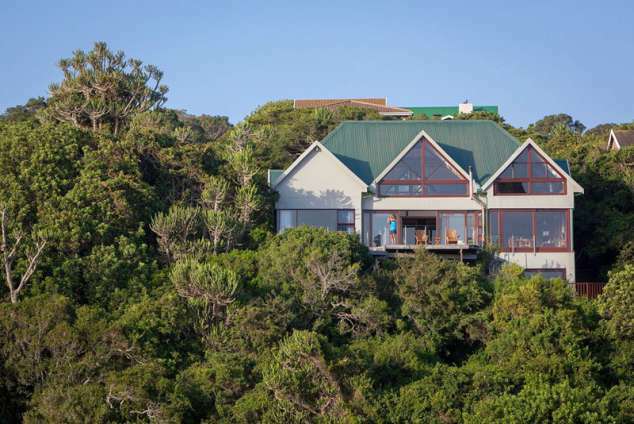 Pet-friendly Westend House is a nature lover's holiday home with all the luxuries in the relaxed beach village of Kleinemonde / Seafield, 15 km from Port Alfred. Overlooking the estuary and 1.4 km from the Blue Flag Beach. Perfect for family gatherings, group entertainment and beach holidays. The house sleeps 10 comfortably in 5 bedrooms (1 king, 4 twins), all with own bathrooms. Sweeping views of the estuary from the large wooden decks. Large braai and entertainment area with 55" UHD-TV, Premium Dual-View DSTV, uncapped 4mbps internet wifi. Second downstairs TV lounge with own DSTV, DVD, deck and kitchen. Double garage, full interior and exterior security system, electric gate, off street parking. Fully fenced. 15302 page views since 07 Sep, 2010. Last updated on 28 Dec, 2018.